I’ve needed a little bit of inspiration for dinner lately. I feel like we are in a bit of a rut. So, I decided to turn to some old recipes that I haven’t made in a long time. One of the one’s I turned to was this Southwestern Falafel. I guess, what’s old is new again. So, I made this Southwestern Falafel again. (I posted about it in 2010.) But, I served it a little differently this time. And, I’m happy to say that the husband said he hopes we have this for dinner again, not once, but twice while we were eating; I knew it was a hit. We used to go to a restaurant called Daphne’s. Most of them around us have gone out of business now, but, the way they served their falafel inspired me to serve mine like this. Dan said, “This is the way I always wanted Daphne’s to taste.” Cool, so these little Southwestern Falafels not only were good, but they were better than the ones at the restaurant. I made an easy Spanish rice to go along with the falafel. Simply take some cooked rice (brown or white or a combination of both) and mix in a little salsa. I usually do about 1 cup rice to 2 tablespoons salsa, or more or less to your liking. That’s it. Easy & yummy. For the salad, use greens like spinach and romaine, add in some shredded carrot and chopped red pepper, and drizzle on a little Italian Dressing. For plating, place the salad on the plate, spoon some Easy Spanish Rice next to it. Place a cooked falafel patty on top. Sprinkle the whole thing with a little cilantro and chopped red onion for garnish, and place a dollop of ranch dressing or tazatziki next to the falafel. Serve with flatbreads if desired. There you have it, a super easy, yummy, and healthy meal! Place pinto beans in the bowl of a food processor, and pulse until a coarse puree forms. Add cheese, tortilla chips, scallions, bell pepper, cilantro, garlic, chili powder, salt, and pulse until well combined. Add egg white, and pulse a couple of times to lightly combine. Remove mixture from food processor, and stir in egg white to thoroughly combine. Heat oil in a large skillet over medium heat. Add patties to pan, you may need to work with only 1 or 2 patties at a time, and cook until golden brown on one side, 4 to 5 minutes. Flip patties and cook until underside is golden, 4 to 5 minutes. I love falafel, but never make my own. Now I have a great recipe to make it from. OMG this sounds AMAZING I must try these! I love a good veggie meal! I am totally loving this idea, fantastic recipe! Thanks for sharing an awesome way to make fafafel! I saw it and looks absolutely delicious. I think it matches perfectly with tzatziki! I’m loving the Southwest twist Debi! What a great combination Debi! I have put this on my list to do! I love your idea of a southwestern falafal. Just like you, I have gone back and brought a new recipe to life when I am in a cooking block. 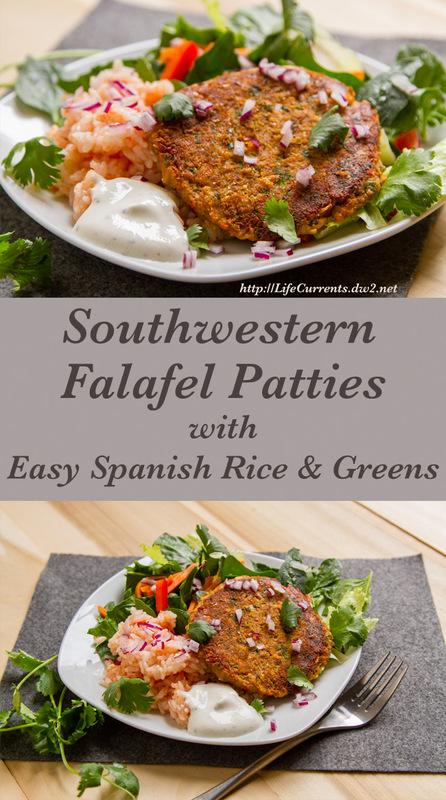 This works great as a falafal and even as a Burger patty. I can see why this version was a hit. Nicely done. Oh man! Totally craving these little beauties! Falafel is one of my favorite things! Yum! I am drooling over your falafel Debi…a must try for me very soon! I love falafel and your rendition is absolutely mouthwatering! These sound great and wonderfully spiced and flavoured. This looks fabulous, Debi! I have never tried making falafel, but I’m going to now!